Finally caught up with Jean on seeing this one. He saw it on a plane. I decided to wait for a full-size screen and stereophonic sound: I watched in on DVD on my BluRay player. Natalie Portman, Mila Kunis. 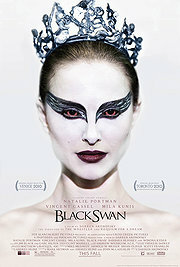 Ballet dancer struggles to portray The Black Swan in Swan Lake as her mental health deteriorates. She says: Incredibly riveting even though it doesn’t have that much plot—Nina gets the lead role in Swan Lake early on, then spends the rest of the movie struggling to portray the seductive Black Swan as effectively as the virginal White Swan. The drama is all internal, as Nina is in an increasingly fragile mental state, but since we see the movie through her eyes only, we, like her, can never be sure what’s real. He says: It was a good movie, eh? Pretty disturbing, though. Categories: Movie reviews | Tags: dance, drama, movies, technology | Permalink.